Well...I can't say this didn't make me a little nervous. I can't think of a better time to use the Canon 6D/EOS Remote wifi functionality. We could actually see what the heck we were doing in real time as the camera jutted out into thin air over a two story drop. Good times. Does The Camera Make A Difference? It’s early evening as the sun begins to set on another clear, brisk winter day at Yosemite National Park. A car traveling through the park, on its way to the Ahwahnee Hotel suddenly screeches to a halt and the driver springs from his seat. From the trunk of the car he grabs a tripod, his camera, plus a light meter and within minutes captures one of the most revered photographs of the last fifty years. The driver of that car was Ansel Adams and the photograph is “Moon and Half Dome”. The image of the moon (perfectly exposed, which is no small feat in itself) suspended above the Dome’s two thousand foot cliff is a brilliant example of the vision, timing and technical skill employed by Ansel. That, or the camera he used must have been especially fancy and expensive. It may sound silly to distill all of the intricacies of that photograph - that moment - down to technical specifications, but a few years ago a group of nearly three hundred photographers attempted to do just that. They teamed up with university astronomers to pinpoint the exact date, location and time of day required to recreate the light on the cliff and position of the moon in the sky with hopes of duplicating Adams’ masterpiece. The group had superior cameras with more dynamic range, lenses that were sharper and had less distortion, plus more time to get the shot. At the end of the day, however, their photographs paled in comparison to Ansel’s - it wasn’t even close. Going by the example above, it seems there is more to capturing a beautiful scene than just pointing an expensive camera at it. But does the camera play any part at all, other than to simply record light? While researching “Moon and Half Dome” I was surprised to read that Ansel’s daily camera kit wasn’t comprised of simply a trusty 8”x10” view camera, a couple of lenses and a pile of film. In fact, the list of gear he carted around in his station wagon would make even the most insatiable gear hoarder blush. When Ansel went out for a day of photography, he typically brought along seven cameras and nineteen lenses. Although he did have that big view camera with him, Ansel recognized that each camera system had its own photographic strengths and used them all. More importantly, he understood that every camera and lens combination could cater differently to his vision for the photograph he was making at the time. He matched the camera to his vision. A number of years ago, I had the chance to shoot a Hasselblad 500C, which is a square format film camera. Looking down at the enormous waist level viewfinder through that 80mm Zeiss lens was something I had never experienced. It blew my mind and changed the way I have taken photos ever since. If you ever have the opportunity to shoot a Hassy, don’t pass it up (I ended up buying that very camera). Until that time though, I was shooting every day with what I thought was my photographic soul mate - my Canon 1D III. It was the fastest shooting digital camera at the time and that thing fit my hand like a glove. It was made to be worked hard and work it I did - shooting over 50,000 photos with it every year for nearly three years. But that old, clunky Hasselblad film camera and the images it produced hit my creative soul like a freight train. I quickly realized that the $15,000 pile of Canon lenses I had in my kit were all purchased in an attempt to create imagery that the Hasselblad put out without blinking an eye. For the first time, I had matched a camera to my vision. After diving head first into the world of small, medium and large format film photography for four straight years, I have found myself with my own diverse set of cameras and lenses. I moved from one camera that I thought could tackle everything, to a number of cameras, each with their own specific purpose. Today I shoot small and zippy 35mm rangefinders (perfect for fast, candid photography) all the way up to huge 4x5 view cameras with radioactive lenses taken out of old WW2 spy aircrafts (which creates the most three dimensional photographs I have ever seen). It’s a bit of a rag-tag bunch, but I have never produced more beautiful and meaningful imagery that fits my photographic vision than I have with those cameras. In a world where nearly all photographers are using essentially the same cameras, with identical features and the same lenses (no matter what the brand), I can’t help but think that there are those out there who are inadvertently missing out on the unique thrill of seeing their vision come to life - I certainly was. Does the camera make a difference? For someone with a clear sense of their photographic vision or for those who are actively trying to figuring that out, I believe it does. One of the last bits of information I learned about the making of “Moon and Half Dome” was that the great Ansel Adams didn’t capture the image with an 8”x10”. He took that photograph with a clunky, old Hasselblad 500C. I initially wrote this article for my other photography website, Ryan+Beth Photographers. You can see the original article here. While digging through some old print folders, I came across this 20x30 print from one of my first commercial assignments. I took this photo while hanging off the end of a pick up truck, doing highway speeds with nothing to catch me if I slipped up. With every bump of the road, I'd get shuffled just a little closer to the edge of the gate (heck of an entrance into the world of commercial photography, hey?). Seven years later and I still sometimes feel as though my nose is only a few inches from the pavement. I'm loving the monochromatic design of this office space! This set is from last weeks shoot with AMR Design. The first two images were shot with a Mamiya 80mm f4 Macro and the third with a Canon 50mm 1.4. 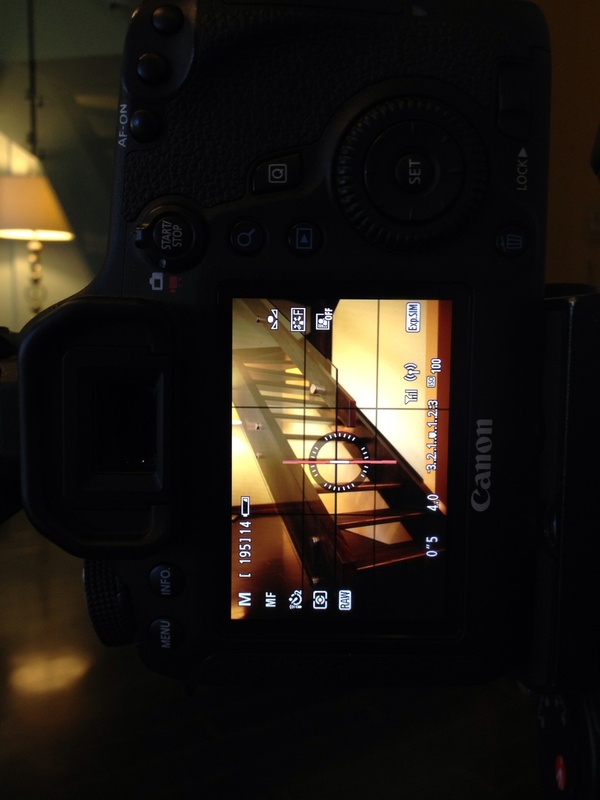 Spent the day shooting some rather baller staircases. Anyways, Specialized Stairs makes some fantastic staircases. The first one I shot today had a waterfall running through it. No big deal. I'll post some shots sometime in the next couple of weeks! Shooting some interior design work for AMR Designs. I'm taking the shot with one of my favorite lenses, the 80mm Mamiya-Sekor Macro C! Canon 6D + EOS Remote App. Not Totally Useless! I just finished up photographing a home for Edmonton builder Coventry Homes and thought I'd post a quick preview. There was plenty of light to work with, so my off-camera flash use was kept to a minimum. I like tend to avoid wide angle lenses like the plague, so the shot on the left was taken with a 50mm lens. The one on the right needed a bit more real estate (so to speak...) so I used my Canon 24mm TS-E II. I don't always use wide angle lenses...but when I do, I use one that I had to sell my kidneys to purchase. This iPhone screen shot of a Canon 6D live-view image of the iPhone taking a screen shot of itself is a bit of a teaser post, I suppose. I've been using the Canon 6D for certain jobs since it was released and I've gotten to know it quite well. I'm going to be putting a post together regarding its wifi capabilities and what a life saver (and back saver) it is in some situations. Interior photographers will love this thing. Check back soon for a new video! Out doing a tech industry shoot today for the city of Spuce Grove. This was shot with my very low-tech, but much loved Mamiya 80mm f4 Macro lens!